Party favors are mementos that party guests can take home at the end of an occasion. Usually, favors are related to the theme of the party. For example, guests at a wedding may be given a small picture frame with a photo of the bride and groom to take home as a reminder of the joyous day. Or, guests at a Valentine's Day party may leave with a bag of candy hearts as their gift for attending the event. Party favors are not essential items, but they are a nice surprise for guests who have attended an event. It's not uncommon for party guests to bring a present for the host or the person being honored, and favors are a small way of thanking guests for brining gifts and also for attending the party. When considering what type of favors to give guests who attend a party, there are several things to consider, and one of the most important is the favors' value. Even if money is not an object, expensive favors that are meaningless and strange will most likely be dumped in the trash once the party guests get home. Cost is not always the deciding factor when it comes to great favors. Favors that cost 50 cents each may be more useful and fun to own than favors that cost 10 dollars each. So, think about the favors and how they might be used and appreciated prior to purchasing and giving them. One way to save money and create a festive environment for a party is to purchase party favors that double as party decorations or place cards. One popular choice, which is common at weddings and other celebrations that require assigned seating at tables, is personalizing small terra cotta flower pots (complete with a flower or plant) with the guests' name and assigned table number written on it. The guest can then take his or her flowerpot to the assigned table where it will sit as a decoration until the party is over and the guest can take the plant home. Favors can be found just about anywhere. Many people shop at their local Party City or US Toy Company for favors. These stores carry hundreds of inexpensive items that can be given as gifts. However, many people like to be a bit more creative with their favors, and like to shop at their local craft stores such as Michaels or Hobby Lobby for the items they will need in order to make their own favors. The nice thing about craft stores is that they usually carry magazines that can provide lots of ideas. Also, the individuals who work at these stores can usually give advice and suggestions on making favors at home. 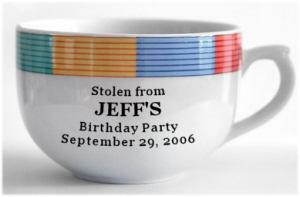 The trick to finding the perfect favors for a party is to plan the party well in advance of the date it will occur. If enough time is given for preparations, the perfect favors will probably be found in a store where they are least expected - like one filled with discount or closeout items such as Tuesday Morning. When in doubt, it's usually safe to provide party guests with some sort of edible favor. Some of the most common types of edible favors are made of chocolate, candies or cookies. The beauty of edible favors is that they can be purchased in many different shapes, colors, and themes or they can even be handmade and wrapped at home. When it comes to making or selecting party favors, there's no need to stress or break the bank. Simple favors are often better. Simply select a memorable, useful favor that matches the theme and tone of your party, and your favors will be a hit.